An ambulance driver has said staff had "no towels or rolls for mopping up sick" while transporting non-emergency patients to hospital. The driver claimed he had not been able to fully disinfect his vehicle. His employer, VM Langfords, is one of several subcontractors which began taking NHS patients to clinics and hospital appointments in April. It said it now had kits for infection control and "decontamination centres" would be installed next week. Speaking to BBC Sussex on condition of anonymity, the Bognor Regis-based driver said they were given "a bucket and some washing up liquid". He said at the start "all the decent equipment, the stretchers, the brand-new vehicles that were promised, hadn't turned up". He added: "There wasn't even any sinks to wash.
"Lots of parts on the vehicle didn't work. The ramp didn't deploy very well and modifications made it even worse for getting wheelchairs up. "There was very, very little sanitary provision. We just had sick bowls. There was no towels or kitchen roll for mopping up sick or anything." He said he felt "absolutely devastated" and "so bad" about the service provided to his patients. Alton-based VM Langfords operates 40 ambulances across Sussex for contract holder Coperforma. VM Langfords said its ownership changed on 10 May and "it is therefore very difficult to validate or deny these claims". It said: "When we took ownership on 10 May, a company was commissioned to fit decontamination centres in all the stations and provide wipe down and contamination kits on all vehicles." It said the installations would begin next week and it currently uses decontamination kits "for mandatory infection control". 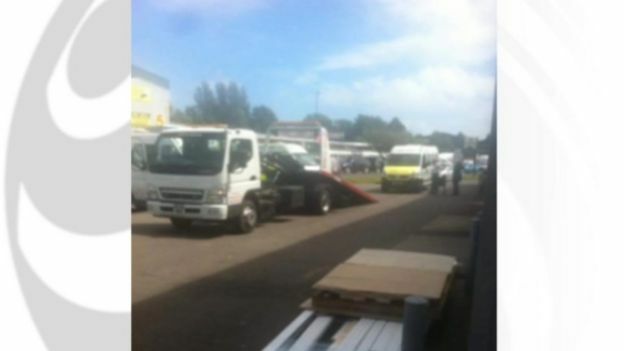 Last week a union released pictures purporting to show bailiffs removing a VM Langfords ambulance as the company ran into financial difficulties. Insolvency practitioners Peter Hall said it was "actively marketing VM Langfords and looking to make a sale by the end of the week (24 June). Coperforma took over non-emergency ambulance services in Sussex on 1 April. Earlier this month hospital chief executive Dr Adrian Bull warned of significant patient dissatisfaction and a safety risk to many patients.